On any given day in America's news cycle, stories and images of disgraced politicians and celebrities solicit our moral indignation, their misdeeds fueling a lucrative economy of shame and scandal. Shame is one of the most coercive, painful, and intriguing of human emotions. Only in recent years has interest in shame extended beyond a focus on the subjective experience of this emotion and its psychological effects. The essays collected here consider the role of shame as cultural practice and examine ways that public shaming practices enforce conformity and group coherence. Addressing abortion, mental illness, suicide, immigration, and body image among other issues, this volume calls attention to the ways shaming practices create and police social boundaries; how shaming speech is endorsed, judged, or challenged by various groups; and the distinct ways that shame is encoded and embodied in a nation that prides itself on individualism, diversity, and exceptionalism. 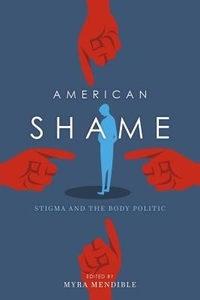 Examining shame through a prism of race, sexuality, ethnicity, and gender, these provocative essays offer a broader understanding of how America's discourse of shame helps to define its people as citizens, spectators, consumers, and moral actors.